In the area now known as Cherry Hill, the first permanent settlers after the Native Americans were farmers. Abel Bliss and his descendants operated a farm west of Gougar Road at today's Haven Avenue. 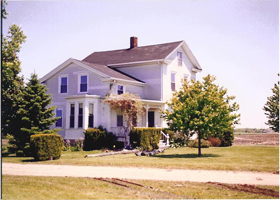 The farmhouse (shown below, shortly before its removal to Joliet Township) was a hiding place for escaping slaves, traveling the Underground Railroad. The name came from the large cherry orchard in the area. William Barr purchased from Harry Thompson 100 acres in 1921. On the property Barr built a home (which burned in 1940). 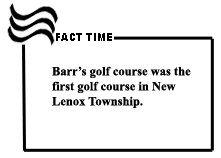 However, Barr's main goal was to build a golf course on the property. The 9-hole golf course was located on the eastern part of the Barr property (present day boundaries Washington, Calmer, Montieth Streets and Lancaster Drive). The plans for the golf course included houses which had views of the course, although few homes were built. The course operated for three years; closing was due to the economic depression of the 1930s. In the 1930s the club house became a one-room, grades one-to-eight school taught by Alma Lee Thornburg. By 1962 the school district was joined to the New Lenox Grade School District 122. Cherry Hill remains largely a residential community supported by small businesses. The Cherry Hill Industrial Park consisting of large warehouse structures began construction in the area south of Interstate 80 in the 1990s.